First up, you need to ask yourself: “how far am I going, and what am I doing when I get there?” If you’re flying halfway around the world for a city break in New York, then you’ll probably need a hard-sided, wheeled suitcase that’s easy to carry and robust enough to keep your belongings safe. If you’re jumping in the family car and heading to the seaside, a lightweight suitcase or duffle bag would be ideal. It seems obvious, but in fact it’s all too easy to overlook the length of your trip and invest in a piece of luggage that’s completely inappropriate for your needs. The best luggage for international travel is likely to be much larger than the ideal bag for a spa weekend, for example. Large suitcases (75cm) are ideal for two-week breaks, whereas medium suitcases (68cm) tend to be the perfect size for weeklong vacations. Budget is always a consideration. Luggage ranges from less than £80 to well over £1,000, so a lot will depend on the kind of features you’re looking for. The best suitcase brand for you might not be the most expensive one – there’s a piece of luggage for every budget, so decide how much you’re willing to spend in advance and then look for a bag within that price range. Size matters – especially in the days of budget airlines. Cabin baggage allowances are often very strict – a fact that should be taken into consideration when choosing your suitcase sizes. Remember that a larger suitcase will also be much heavier once it’s packed full of your holiday essentials, so biggest isn’t always necessarily best. Soft-sided or hard-sided? Zip closure or three-point lock? The luggage you choose will have different strengths when it comes to keeping your belongings safe. If you’re travelling with a lot of valuables or staying in shared accommodation (hostelling, backpacking etc.) then you might want to think more carefully about the safety features you choose. 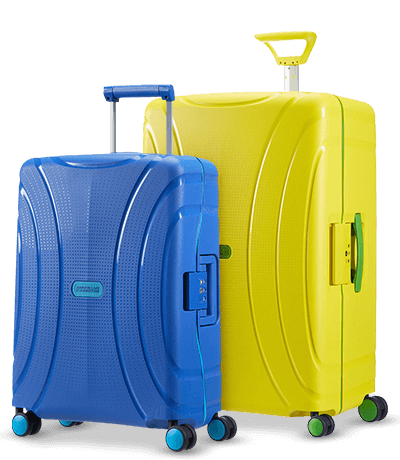 This sturdy four-wheeled suitcase features a three-point lock to keep your belongings safe, and a fun, colourful design you can’t help but spot on the baggage carousel. The Lock’n’Roll comes in three sizes: 55cm cabin baggage, 69cm for weeklong trips, and 75cm for two-week getaways. 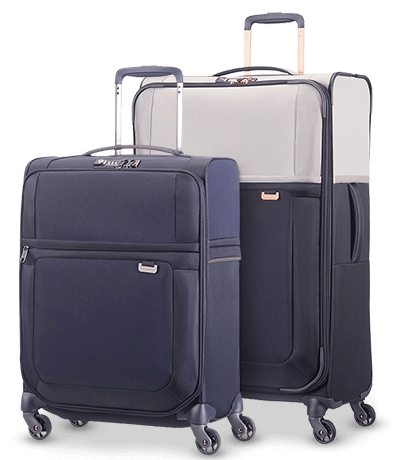 The Samsonite Uplite Spinner is a lightweight, soft-sided suitcase featuring an expandable design that adapts to your travel needs. You’ll be thankful for the well-organised interior when it comes to unpacking, while a TSA lock helps to keep your belongings secure. 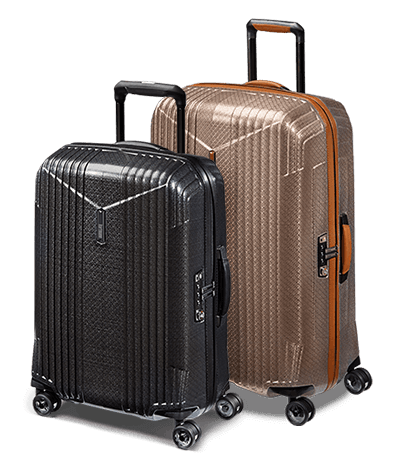 The Hartmann 7R Spinner combines style, durability and practicality in the ultimate go-anywhere suitcase. A lightweight, scratch and impact-resistant outer shell, resilient dual-tube aluminium pull handle and recessed TSA lock make this the perfect blend of form and function.